Two versions made in one piece are offered. For the Orange version: graphic fascinator made of wrapped Orange lace and small synthetic straw for the Center. The diameter of the CAP is 42/24 cm. Ceremonial hat that by its minimalist simplicity will make an effect during all ceremonies. 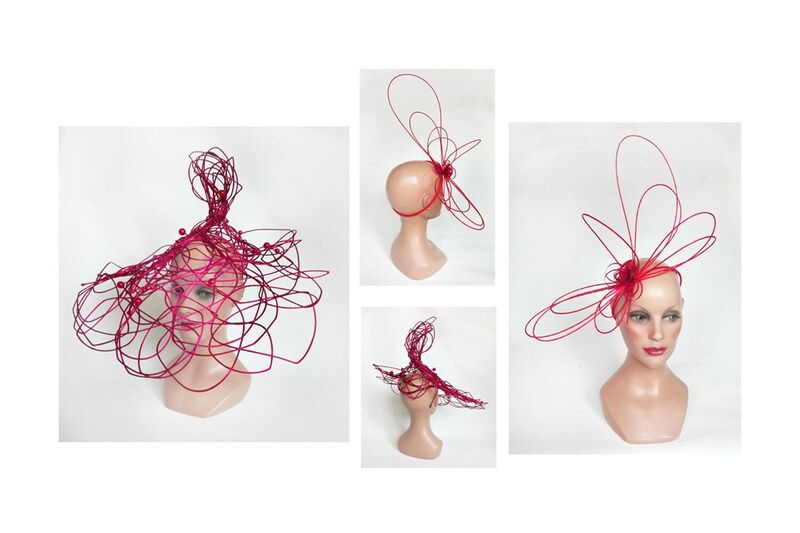 For the Red version: large fascinator composed of a intertwining of curved and broken lines. Made from sheathed red lace and also red plastic beads, its diameter is 45/50 cm. Hat with veil inspiration, exceptional hat, contemporary sculpture hatinator.... It will enhance your ceremonial attire with an artistic edge.